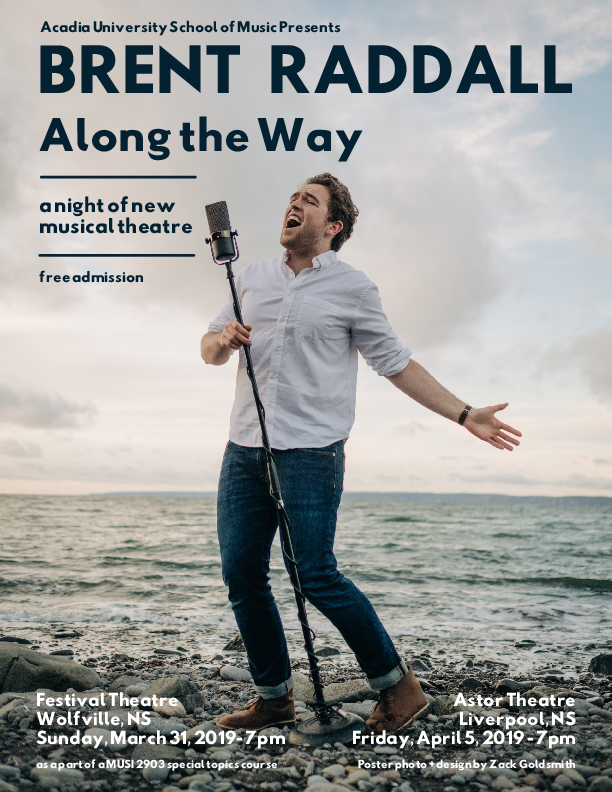 Brent Raddall, a third year Vocal Performance student in the Acadia University School of Music, as a part of a year-long independent study, presents Along The Way, a night of new musical theatre. With a setlist that includes a variety of different characters and themes, it's sure to be a great night! Along the Way also includes the talents of fellow students Kevin Pirker on piano, Maxwell Gallant on percussion, Mitch MacDonald on electric bass, Nathan Cann on guitar, and course overseer/mentor Nic D'Amato on double bass! Featuring the music of Alan Menken and Stephen Schwartz, Jason Robert Brown, Pasek and Paul, and more!